His horse was one of his closest companions. From the hat on his head to the spurs on his boots, he fit the profile. He and his buddies would go from one town to the next to rob banks and end up in a shootout. But it was all an act—at least the robbing banks and shootouts part! From time to time, his acting job would include a minor role in historical movies and western television shows. He really did own a horse, however, and they were inseparable. He did also come from a small farm and enjoys wearing cowboy hats. The acting career is behind him now, though. Terry Ames has matters of eternal consequence to attend to. For the past couple of years, he’s carried out the task of turning around a declining Kentucky congregation which, at its lowest point, survived an attempted takeover. 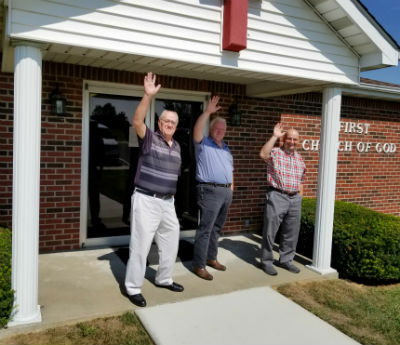 Having a great need for a spiritual shepherd, but without a pastor, First Church of God in Glasgow, Kentucky, was desperate. From time to time, a Church of God minister would fill in at the pulpit, but the congregation’s decline had limited the opportunities. At times ecumenical ministers would preach, most of whom were of utmost integrity. But the church soon found themselves in position where guest leadership introduced clashing doctrine, removed the name “Church of God” from the building, and initiated formal departure from the Movement. It wasn’t until the state ministries office revealed the building’s conditional deed that the threat was quieted. The attempted coup had failed, but not before furnishings were stripped from the property and a few remaining individuals were left with only their rock-solid faith and a glimmer of hope. But as the gates of hell would soon discover, such faith and hope is a force to be reckoned with. 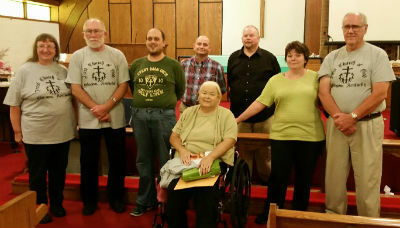 Terry Ames with several of the faithful congregation. Meanwhile, the Lord was preparing Terry Ames for a new chapter in his life. Raised by a Vietnam veteran and spending most of his adult life as a law enforcement officer—and finally, chief of police—his life was disciplined and structured. After accepting Christ at the Church of God in Custer, Terry realized that Jesus was not only his Savior, but his boss, as well. This meant that Terry would be obliged to obey whatever Jesus would command. He’d gained experience as a fill-in for the senior pastor at Custer on occasion, but hadn’t served as a senior pastor. But beginning four months before Glasgow was ever on Terry’s radar, the Spirit began routinely awakening Terry from sleep at three in the morning with a dream. In this recurring dream, the Lord was prompting Terry to let go of one of his dearest possessions. 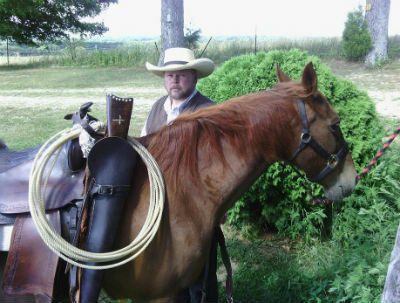 Terry knew it was time to let go of his twenty-three-year-old Tennessee Mare. It was agonizing to say goodbye to an old friend, but in classic Jesus-fashion, the Lord couldn’t have worked it out any better. The horse ended up with a young man who would care for her and train young children to ride. Then, seemingly out of the blue, the memorable phone call came from Darryl Allen, then state minister for the Church of God in Kentucky. Drive by First Church on Sunday morning and receive a welcoming wave from these guys! Some immediate attention to the building was required. Mold had formed in the basement, the sidewalks and parking lot wasn’t safe or handicap accessible, and the bathrooms needed work. Instead of accumulating debt, Pastor Terry led the church to commit to giving and saving up for the needed repairs. Because the mortgage was already paid off, this wasn’t as hard as it could have been. Still, some sacrifice and great generosity was necessary. Two years later, the parking lot is paved and more upgrades are in the works. The church has grown by 400 percent, and five individuals have been baptized. Pastor Terry has filled the leadership void, but will not take credit. He knows that God made it all possible, giving the humble group of believers the courage to stick with it. In Glasgow, Kentucky, across North America, and around the world, God is on the move in the Church of God. Join the movement. Reach our world. Donate today at give.jesusisthesubject.org. This entry was posted in All Church of God, Southeast and tagged acting, actor, attempted takeover, building campaign, church decline, church growth, church health, church turnaround, courage, Cowboy, Custer, Darryl Allen, faithful few, faithfulness, Glasgow, horse, Kentucky, KY, prayer, property improvements, Reclaim, restore, revitalize, Terry Ames. Bookmark the permalink.